المناطق الواقعة تت سيطرة الجمهورية العربية الصحراوية الديمقراطية بالأخضر الداكن، والأراضي التي تطالب بها بالأخضر الفاتح. Article 4 of the Sahrawi constitution. The SADR government is based in the Tindouf refugee camps in Algeria. 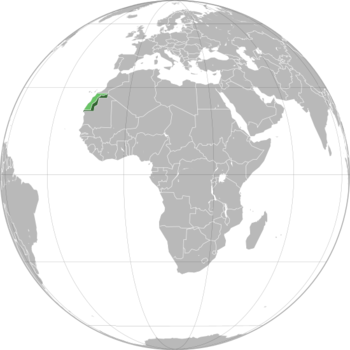 They control the area east of the Moroccan Wall in Western Sahara which they label the "Free Zone". Bir Lehlou is within this area. Area of the whole territory of Western Sahara claimed by SADR. 500,000 is the estimate given for the population of Western Sahara based on comparative study of population growth since 1975, the date where the last census took place in Western Sahara. 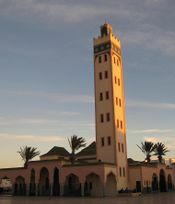 100,000 is the estimated number of people living in the Tindouf refugee camps in Algeria where the SADR is headquartered. 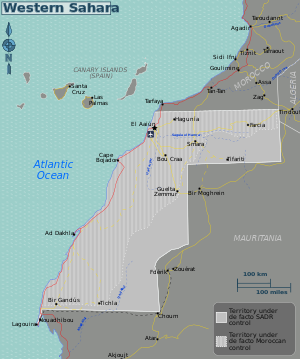 80% of the territory claimed is under Moroccan administration. Associated with Western Sahara but not yet granted to any claimant. خريطة الصحراء الغربية، موضح عليها المناطق الواقعة تحت سيطرة الجمهورية العربية الصحراوية الديمقراطية والمغرب. الممثلة الإسپانية ڤرونيكا فوريك في مهرجان الصحراء السينمائي. ^ Until complete independence. 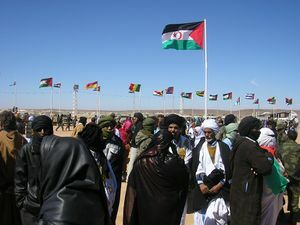 Article 32 of the SADR constitution states: The Polisario is the sole political formation allowed for Sahrawis to exercise politics until complete independence SADR. "Constitution of the SADR". Archived from the original on 11 November 2007. Retrieved 19 October 2011. 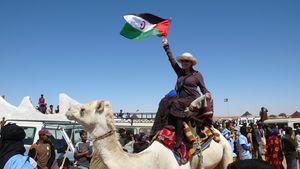 (بالعربية) (بالإسپانية) "POLISARIO.es Official website of the Sahrawi Delegation in Spain". Janos, Besenyo (2009). 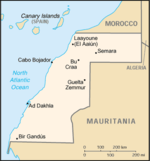 Western Sahara (PDF). Pécs: Publikon Publishers. ISBN 978-963-88332-0-4.